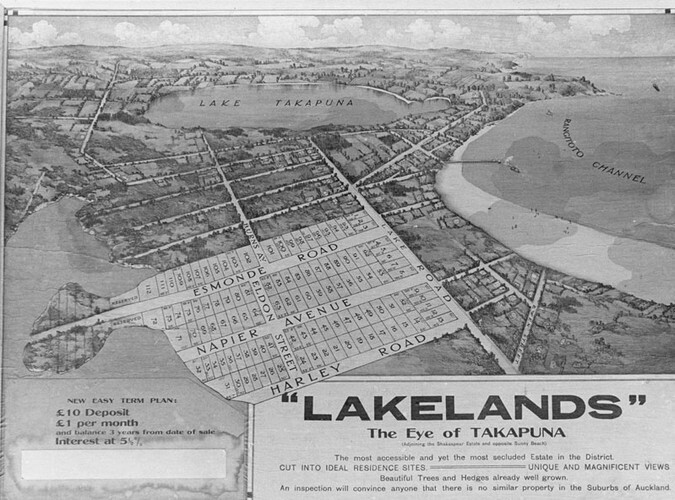 Local historian David Verran delves into the development of suburban Takapuna at the beginning of the 20th Century. From the 1850s, Māori and Pakeha settled around Lake Pupuke. Their early settlements were improved with the introduction of the ferries at Barrys Point into Taharoto Road. After 1895, a ferry service from Takapuna Wharf enhanced this area further, and from the 1900s onwards various developers such as Paul Hansen and the Napier family purchased, surveyed and subdivided the area to the south of the Lake, which included the Patuone land grant, and the development of the Shakespeare, Lakelands, Sunny Beach, Beacholm, Hauraki, Cliftonville, Harbourside, Eversleigh and Bayswater Estates.